Thanksgiving has come and gone in Canada. We celebrate it on the second Monday of October, this year it was on October 10. 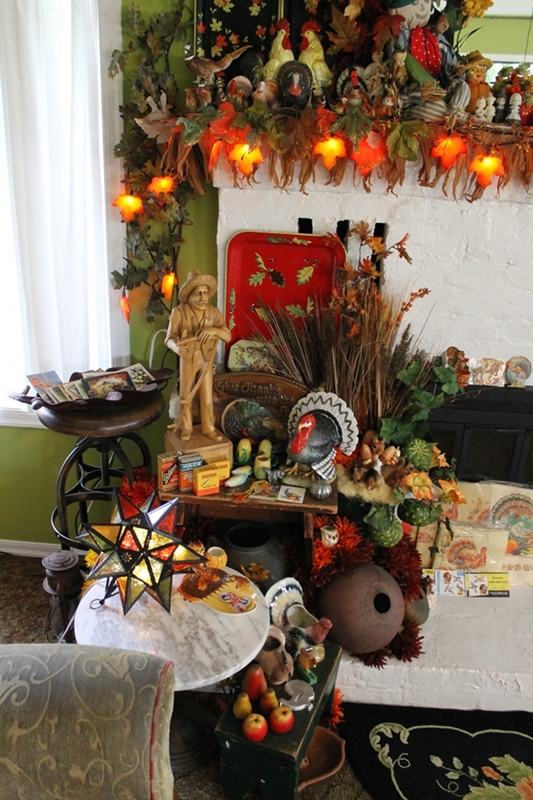 Here are pictures of this year's Thanksgiving display. This photo shows the entire display. I don't own a lot of Thanksgiving items so I have stretched the collection by adding in anything autumnal. All of the background material goes up first and this year I wanted to have an easy transition into the Hallowe'en display so the needs for Hallowe'en were also being considered. 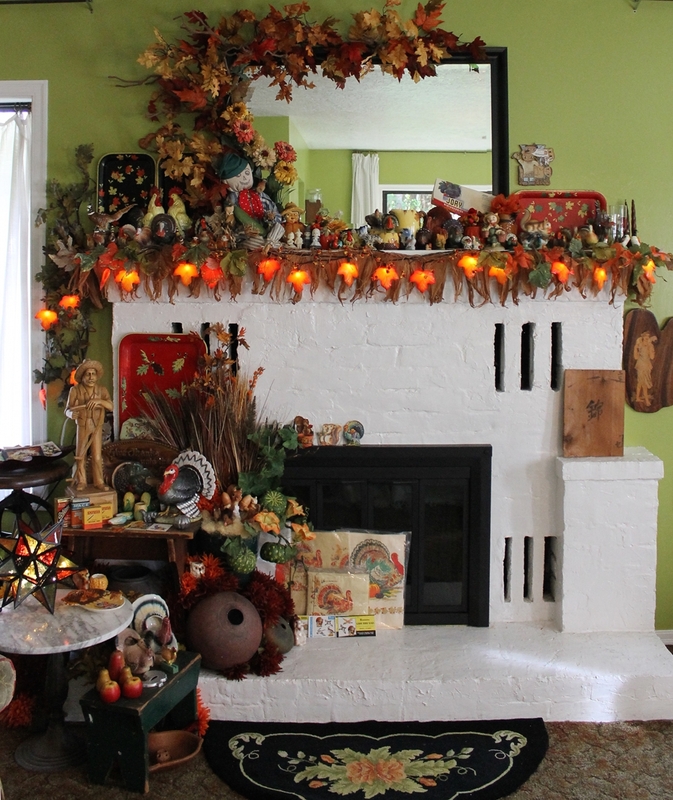 A mix of various faux autumn leaves went up and over the mantle mirror. In with the faux leaves were added some bare branches that I had made several years ago. The colours of the trees in and around Victoria were my inspiration for the abundance of faux foliage that were used. Here is a close-up of the left side of the mantle. The turkeys, pheasants, and roosters, are almost hidden in the foliage. This scarecrow was made about 30 years ago for our oldest boys scarecrow birthday party, two place card holders from the party are on the scarecrows left beside the dill pickle horn that he is holding. The crepe paper zinnias are vintage, possibly 1950's. Gurley candles stand beside turkey, grouse, and chicken salt and pepper shakers. The rest of the mantle is filled with more turkeys, chickens, pheasants, ducks, squirrels, I love squirrels, and acorn related items, I love oak trees. Here is a look at the display below the mantle. The vintage stools add interesting height variations to the display. The large stool features a wood carving by a French Canadian sculptor that my parents bought in the 1970s I believe. 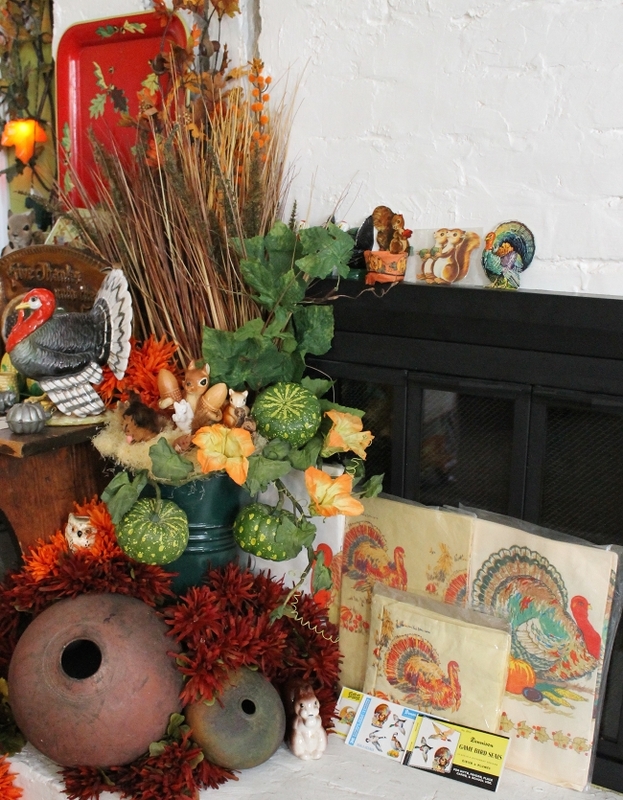 That large ceramic turkey is also among my favourite Thanksgiving items. A large plaster plaque with a horn of plenty and a raised inscription saying, "GIVE THANKS UNTO THE LORD", is in behind the farmer and his turkey. Salt and pepper shakers, turkey florist vases, and a turkey cookie cutter are on the small green stool. My collection of Thanksgiving postcards are in a large plastic fruit dish made in England. The dish is a large oak leaf with acorns that mimics a hand carved wooden dish, it is quite beautiful. These earlier blog posts here, here, here, and here, show most of the antique Thanksgiving postcards. 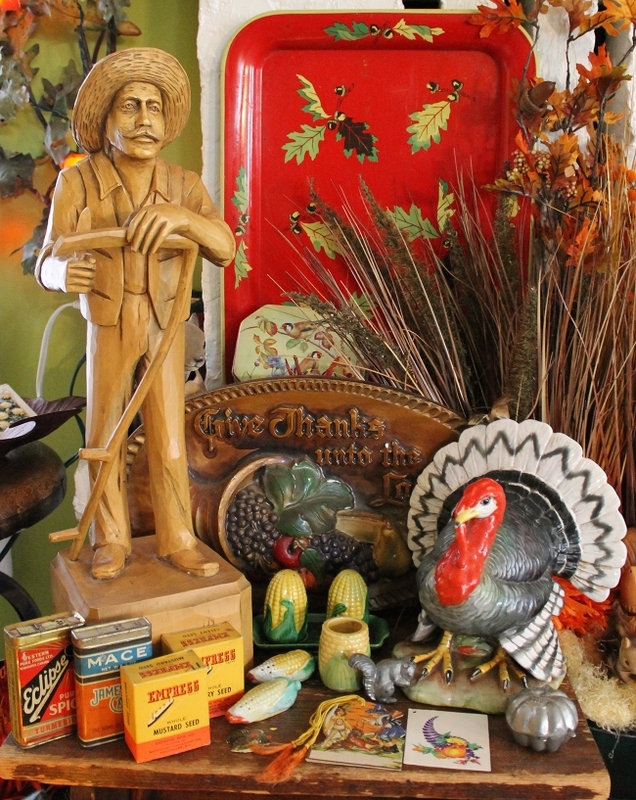 On the mantle ledge in behind the wooden carving of the farmer with his scythe are some nut cups, two Gurley candles, and two squirrel nodders. The small squirrel nodder is an early plastic while the larger squirrel is composition made in Japan. He has a rabbit fur tale that is a little tatty, but he is delightful none the less. This last picture shows a group of squirrels on top of the tall green florist vase. On top of the fireplace screen and in front of it are various paper table cloths, seals, and other paper items. Don't forget, everything in my Etsy shop from November 24 - 28 is 50% off. 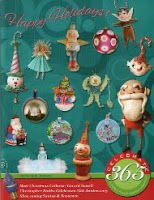 Spend a minimum of $25 and get 50% off of your purchase at checkout, shipping is not included in the discount.